Septic tanks are a concrete chamber (occasionally fiberglass or plastic) where waste water is discharged. Solids settle to the tank bottom while lighter items (grease, hair) float to the top. Clearer water settles in the center of the. Anaerobic bacteria breakdown the solids. Once a septic tank is full, overflow discharges into the drainfield. HOW LONG DOES A SEPTIC SYSTEM LAST? WHAT CAN I DO TO MAKE IT LAST LONGER? Systems can last 5 years (or less) or more than 50 years. Getting your tank pumped regularly (3 to 5 years) will extend the useful life of your system. Starting with a proper design is important, and certainly how well your system was originally constructed and installed is too. Once in operation, proper maintenance is critical. Fixing leaks and removing clear water discharge (softener and sump pumps) will extend the life. Drainfields can and should last many decades. This is the value of periodic septic system inspections. When your septic tank is inspected for proper function, including signs of decay or needed repairs. A boring is performed on the drainfield to determine if the discharge lines are functioning. We also look for root invasion and soil compaction. HOW CAN I AVOID SEPTIC BACK-UPS? Large amounts of rain or high water table can affect the function of septic systems. They drain more slowly and toilets might not flush properly or back-up. Try to minimize septic use during heavy rains. The drainfield is the final disposal area of effluent water from your septic tank, and consists of loose stone with sand below. The water passes through a perforated pipe and the stone, to the sand below. Bacteria break down the organic matter and plant growth (lawn grass, etc.) absorbs the water through its roots and is evaporates into the air. Eventually the aerobic bacteria can no longer perform their job and a black, slimy, sludge (biomat) forms, and the system begins to fail. WHAT IS A SEPTIC TANK PUMP CARD AND WHERE CAN I GET ONE? A pump card is a sheet of paper provided by the septic tank pumper, often including a drawing locating the tank location. Most pumpers use a standard form, but we can supply the pumper a form if necessary. The pump card is written confirmation of the septic tank size and that the pumper observed no problems. WHY IS A SEPTIC TANK PUMP CARD NECESSARY? The tank is an integral part of the septic system. Leaking tanks can cause premature failure of a septic system. The tank is properly inspected when it is empty. The pumper provides information including size of tank, condition, structural integrity, whether the outlet baffle in place, evidence of drainfield flow back and if the lid is cracked or needs replacement? Since we are not onsite when the tanks are pumped, this card provides us important information. WHAT IF MY DRAINFIELD IS IN A STATE OF FAILURE? You will be referred to your local health department to apply for a replacement septic permit. Only the local health department is permitted by law to design and issue a permit for a new septic system. WHAT IF OTHER WATER IS DISCHARGED TO THE SEPTIC SYSTEM? A septic system is designed for an average amount of household sewage. Excessive water, which does not require treatment, is a waste of system capacity. Some water additives are high in salt content and can kill septic tank bacteria, reducing its efficiency. Excess sump pump water can overload the system, leading to premature failure. It’s best to use your septic system only for water that requires treatment. WHY ARE GARBAGE DISPOSALS NOT RECOMMENDED? Garbage disposals send organic material into the septic system, increasing the need for cleaning and maintenance. The organic solids might not settle to the bottom of the tank, and get sent to the drainfield, increasing possibility of premature failure. SHOULD I PUT SEPTIC TANK ADDITIVES INTO MY SEPTIC SYSTEM? These chemicals are a waste of money, especially root additives. If you have roots growing into your septic tank, you should replace it. CAN I PLANT TREES NEAR THE SEPTIC SYSTEM? Trees and shrubs with aggressive root systems, such as fruit or flower bearing trees/shrubs, will inundate the system. The vegetation is used to getting water seasonally. When the water supply stops, the roots may seek the septic tank or pipes of the drainfield. HOW DO I REMOVE A TREE OR SHRUB THAT IS NEAR THE SYSTEM? Cut the tree/shrub down during a dry season, when surface water is minimal. Grind the stump down but do not remove it, as it may do more damage to the drain system. Leave the roots intact. Do not drive anything heavier than an average lawn tractor over the system. WHEN SHOULD I ORDER A SEPTIC INSPECTION? Problems with older septic systems may not be apparent until a thorough septic inspection has been performed. Properties with older septic systems may in fact be close to the end of its life expectancy. Repairs (or possibility of a new system) may be required beyond a septic inspection and pumping. Unexpected or last-minute repairs can be a deal-breaker for the buyers, so it’s better to schedule inspections weeks before closing if possible. WILL THERE BE DAMAGE TO MY PROPERTY? We do our best not to disturb your landscaping. 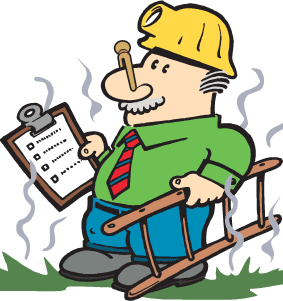 Inspections require digging as evaluations require a soil probe to locate your system. Some grass will be removed and placed back. The probe is used as little as possible. We cannot be responsible for any damage to lines which are not located and clearly marked by the homeowner. Plastic materials, large amounts of acids/caustics, soaps or cleaning materials (the high/low pH factor affects the bacteria), cloth, cigarette butts, paper towels, disposable diapers, toilet tissues which do not decompose readily in water, greasy/fatty materials, motor oils, grease, kerosene, gasoline, paints, other materials which do not dissolve in water. Rainwater from gutters and sump pump discharge should not enter the septic system. WHAT TYPES OF INSPECTIONS DO YOU PERFORM? We are qualified to do both well and septic inspections. WHAT IS INVOLVED IN A SEPTIC INSPECTION? Components of the septic system are inspected for structural condition (tank, effluent baffle tees, pumps, floats). Absorption tests are performed on the drainfield. A minimum of 200 gallons of water are used to test the system’s ability under a normal daily load of wastewater flow. WHEN SHOULD INSPECTIONS BE ORDERED? Don’t put off inspections until the last minute. A system that functions well for a family of two may not function as well for a family of four. Our lead-time is normally 3 days between the order and the inspections. The water test results will require a minimum of 24 hours after the sample is pulled. We recommend that you call us when you get a listing for an older property, even if there is not a contract on that property yet. That way you’ll have time to discuss repairs with your clients. We’ll provide a clear septic system certification letter. If more than 30 days has passed since the initial septic certification letter was sent, we will re-certify the septic system at time of closing, and provide an updated septic certification letter at no extra charge. Your presence is not necessary is you have a key box. With vacant properties, it’s always best to have electric power on, but with the owner’s permission we can use a temporary generator to operate the well/septic system components. Make sure water is on and be available for questions we may have regarding the home and the system. Have the pump card ready. We cannot probe areas with suspected buried gas or electrical lines. ARE HEALTH DEPARTMENT RECORDS NECESSARY? These records contain very valuable information. This information is reviewed and included with the final report, and often provides reassurance to the buyer that the system was originally designed properly and approved by the government agency. Every attempt will be made to estimate the above information, but it is our policy to seek this information whenever possible. CAN THE CLIENT PAY AT CLOSING? Yes, as long as closing is within 30 days of work completion. WHAT IF CLOSING IS POSTPONED? If the bank requires recertification of the water analysis and septic inspection, we will take care of this at no extra charge. HOW LONG DOES IT TAKE TO RECEIVE THE REPORT ONCE INSPECTIONS ARE COMPLETED? As soon as all information is collected, we will have the paperwork sent to you that day. © 2017-2018 Well & Septic Guys.